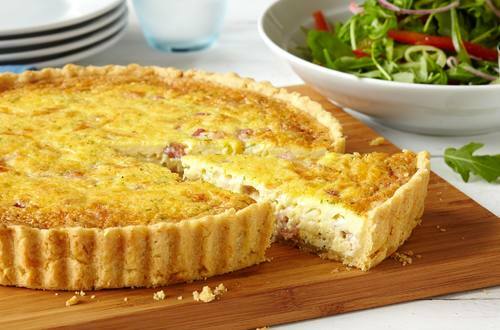 Creamy Quiche Lorraine recipe, with crispy bacon, Gruyère and Hellmann's® or Best Foods® Real Mayonnaise wrapped in golden brown pastry. 2 Beat heavy cream, Hellmann's® or Best Foods® Real Mayonnaise, eggs and tarragon in medium bowl with wire whisk or fork until blended. Stir in bacon and cheese; pour into pie crust. Arrange pie plate on baking sheet. 3 Bake 40 minutes or until knife inserted 1-inch from edge comes out clean. Let stand on wire rack 5 minutes before serving. *If using 9-inch frozen deep-dish pie crust, do not thaw. Preheat oven and baking sheet. Pour filling into pie crust; bake on baking sheet.